Print the file at a local copy/fax/print store. 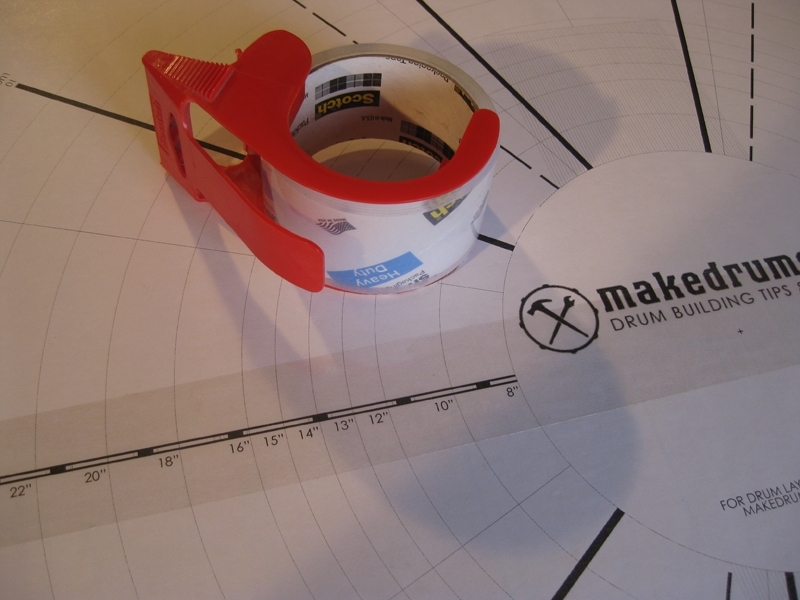 Glue the drum hardware layout mat to a flat surface. I usually have spare wood laying around, but this time I actually had to go to Home Depot to get this. 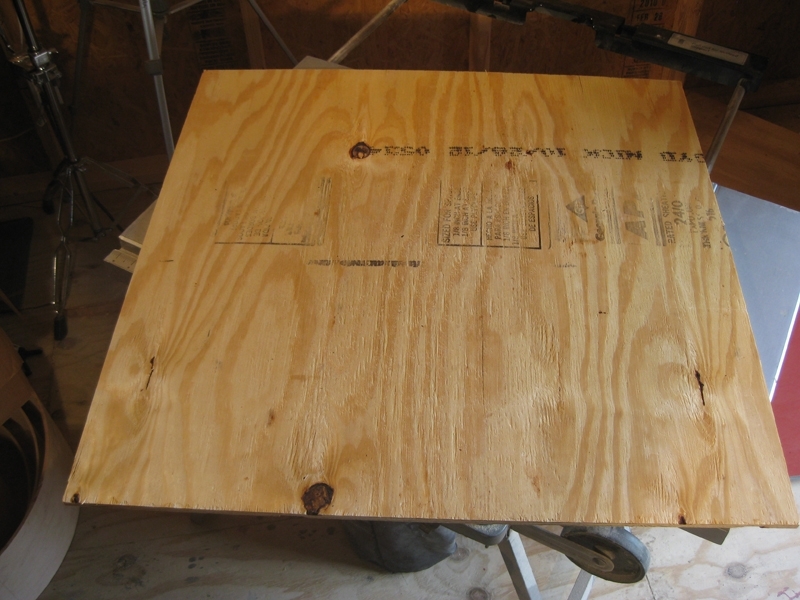 I bought a 4×8′ sheet of 11/32″ ply wood and had them cut me a piece out of it that was 29×29″. 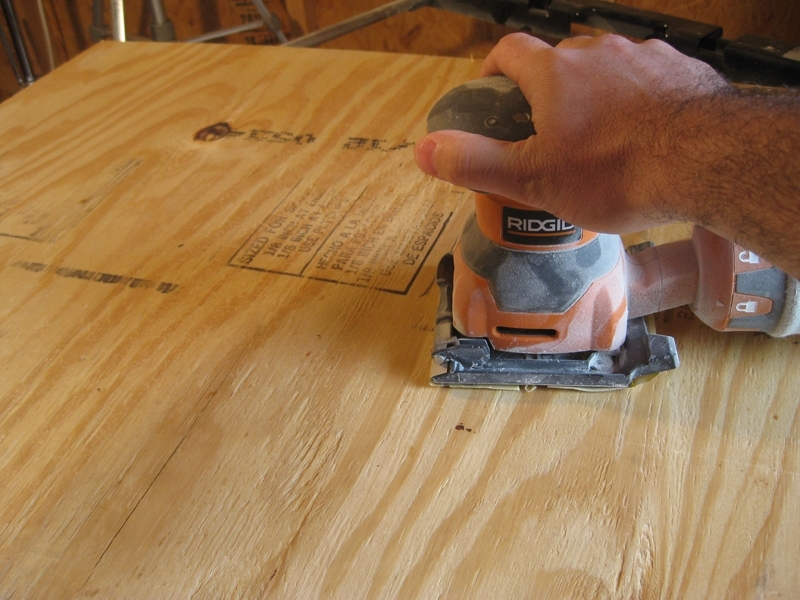 Sand the surface smooth to prevent bumps on your layout mat! 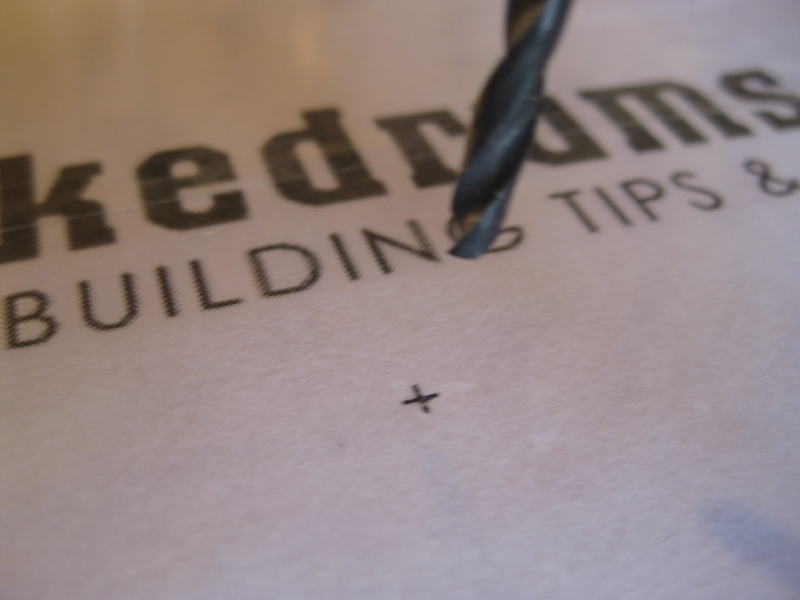 Glue one section at a time. 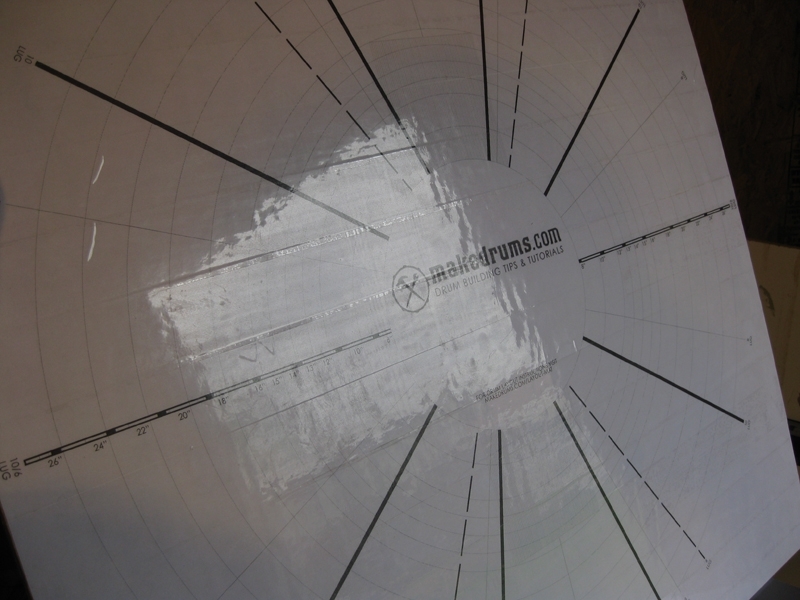 When you have your drum layout mat lined up where you want it, glue one side at a time. 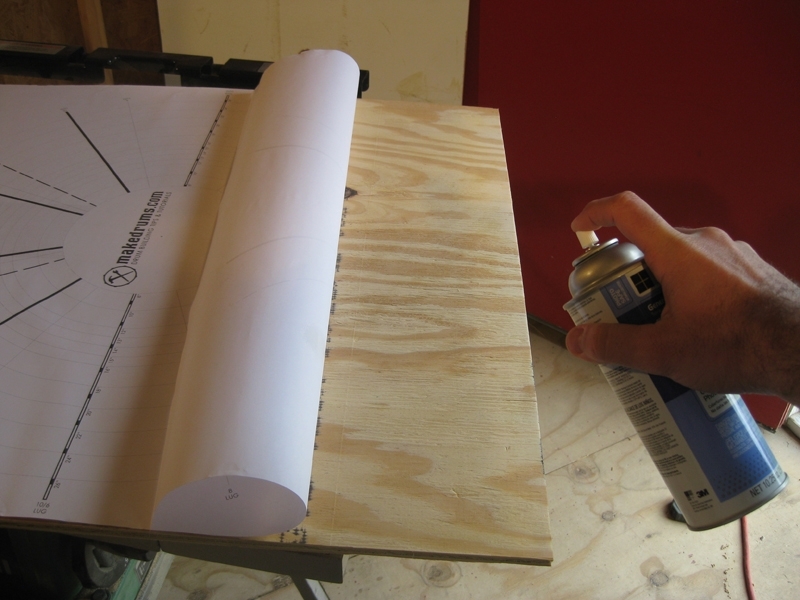 I’m using a spray adhesive from 3m. Smooth out any air pockets. There are a few ways to do this. 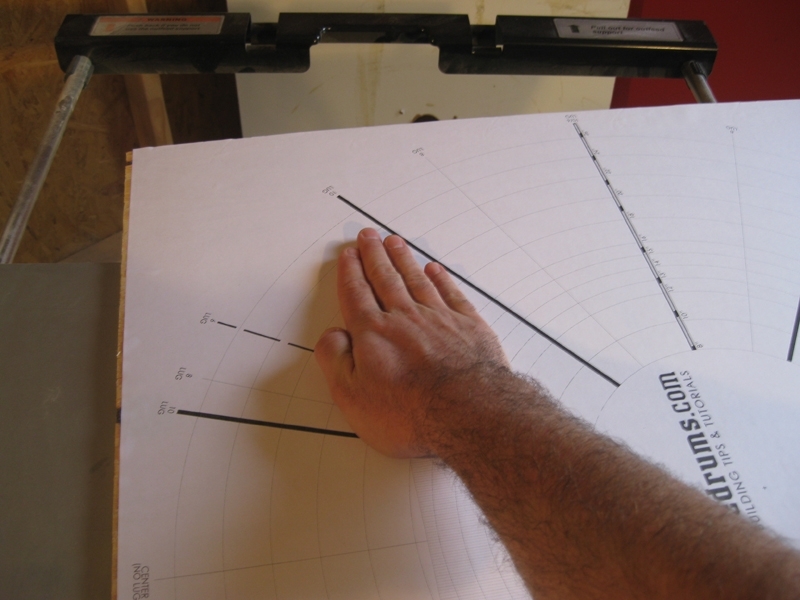 If you have plenty of time you could use clear polyurethane over the paper. I opted to use clear packing tape because it was quick and easy. 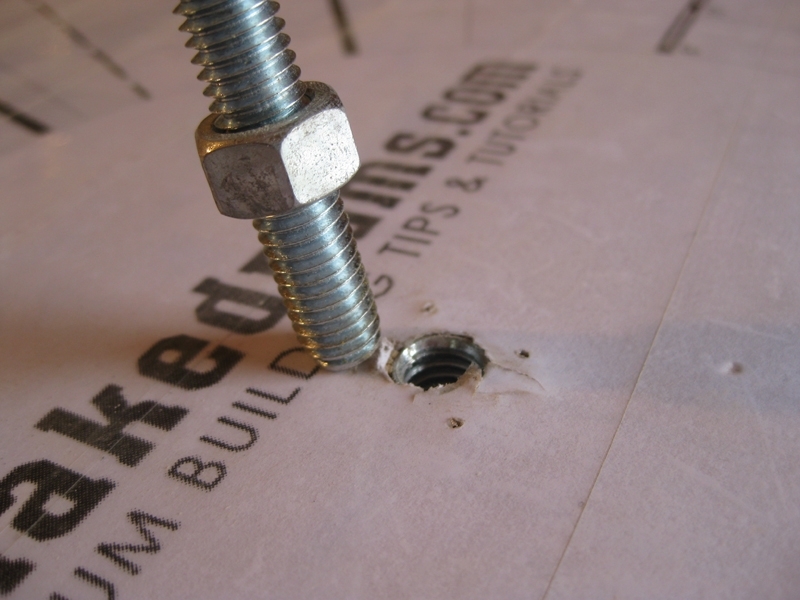 Drill a pilot hole through the center of the layout mat. 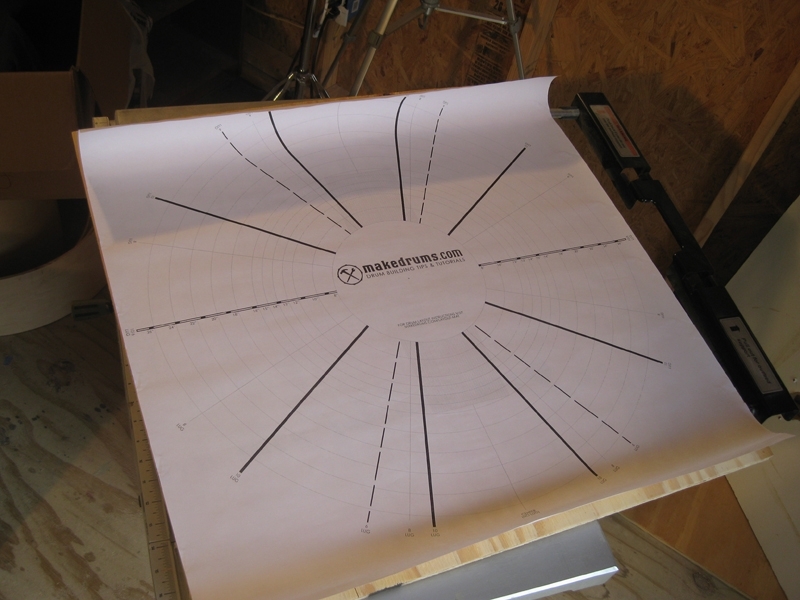 There is a + on the mat so you know exactly where to drill. 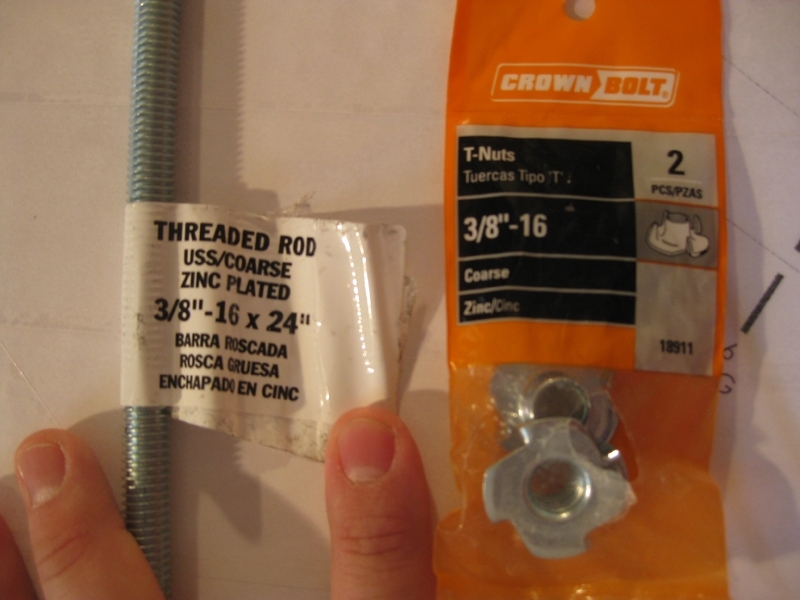 You’ll need these as well! 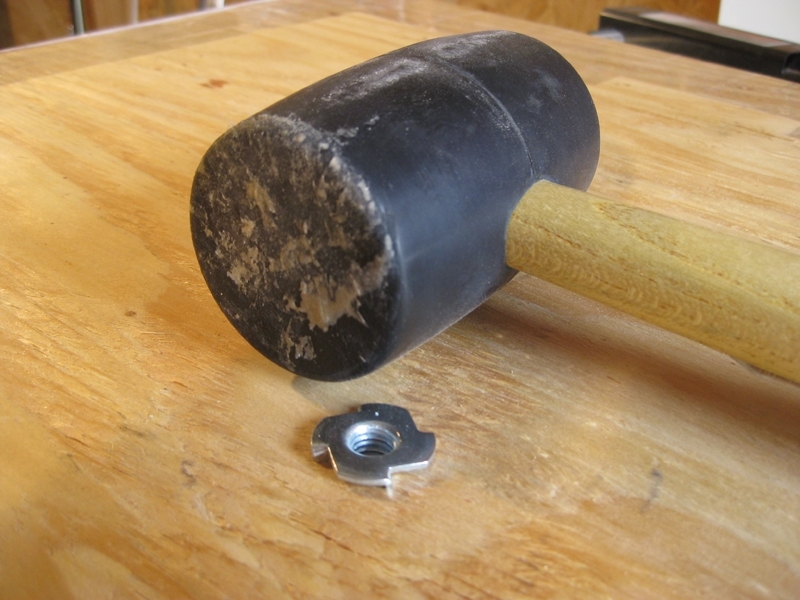 Finish drilling the hole so that you are able to hammer in one of these t-nuts in the bottom. 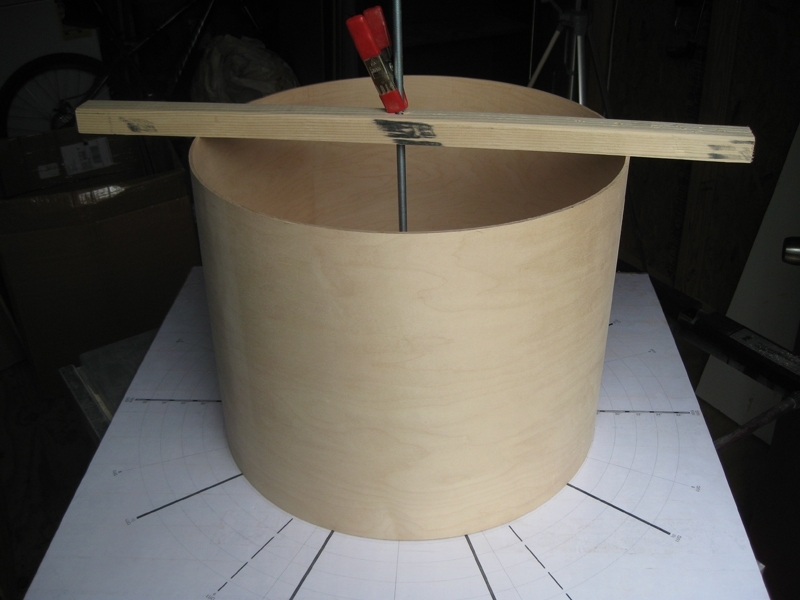 Use 28″ piece of wood and a clamp to secure the drum shell. I happened to have a piece of wood laying around in the shop. 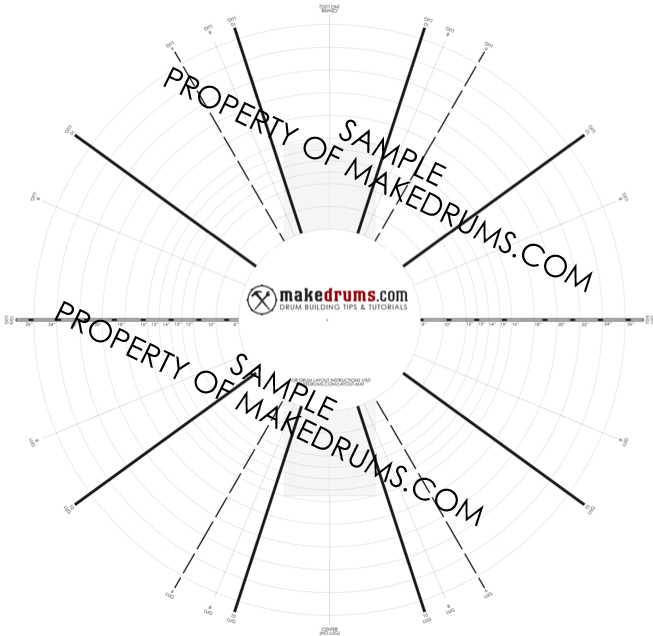 I just drilled a hole large enough for the metal rod to pass through and used a spring clamp to apply pressure to the shell so that it doesn’t move while I’m laying out my drums! 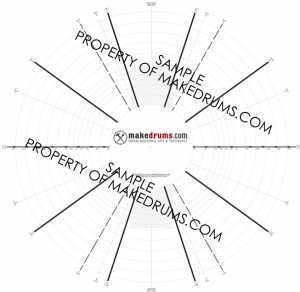 This drum mat seems to be a copy of a freely available drum mat offered online. I don’t understand why you are charging for it.